(May 1, 2017) Abracon, LLC. 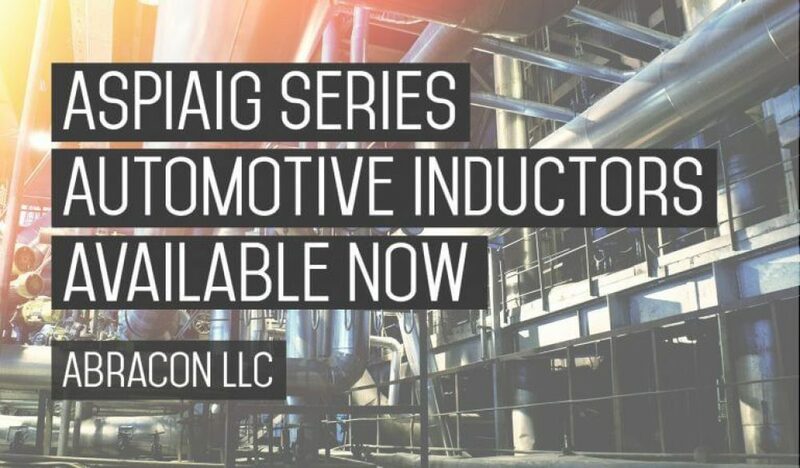 (Abracon), a leading global manufacturer of frequency control, signal conditioning, clocking and magnetic components, announces the ASPIAIG inductor series designed for automotive, industrial, and other high grade applications. The high performance shielded surface mount (SMD) inductors featuring high current density are ideal companions to switch mode power supply ICs in applications requiring extreme durability and reliability such as automotive body electronics and comfort system, infotainment, navigation, transportation, LED lighting ballasts, solar power inverters, and industrial Internet of Things (IIoT). The full series is Automotive AEC-Q200 certified, supports -40℃ to 125℃ operating temperature range, and offers both low and standard profile form factors. Built using TS-16949 qualified production line and featuring PPAP level 3 support, the ASPIAIG inductors meet next gen DC/DC converters and switch-mode power supplies requirements with excellent size to power density tradeoffs. ASPIAIG-H6530 and ASPIAIG-H8540 are optimized for compact and low profile applications requiring low DC resistance (DCR), high energy density and high saturation current while maintaining high inductance. Using an advanced Fe-base metal material and wire-wound construction these inductors meet high reliability requirements. The ASPIAIG-H6530 is available with a low profile 7.1 x 6.5 x 3.0 mm package and ASPIAIG-H8540 in 8.8 x 8.5 x 4.0 mm. Inductance values range from 0.22uH to 33uH. The family offers saturation currents as high as 32A with guaranteed 3.5mOhms DCR at 25℃. Shielded construction reduces EMI. ASPAIG-S6055 and ASPAIG-S8050 are available in 6.0 x 6.0 x 5.5 mm and 8.0 x 8.0 x 5.0 mm dimensions, respectively. Inductance values range from 1uH to 470uH. The family offers saturation currents as high as 16A with guaranteed 24mOhms DCR at 25℃. Shielded construction reduces EMI. The ASPIAIG series of inductors are available off the shelf and offered through Abracon’s franchised distributors. Abracon is a global manufacturer of frequency control, signal conditioning, clock distribution and magnetic components. Abracon offers a wide selection of Quartz Crystals, Crystal and MEMS Oscillators, Real Time Clocks, Antennas, Bluetooth Modules, Ceramic Resonators, SAW Filters, SAW Resonators, Inductors, Transformers, RFID Tags and RJ45 Jacks. The company is ISO9001-2015 certified with design, warehouse and applications engineering resources in Texas and offices in California, China, UK and Germany. Abracon’s products are offered through its global distribution network.